I may not believe in Santa but my cousins do. This app allows me to tell them where Santa is at. 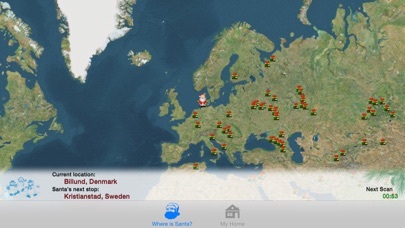 Also, I can show my cousins where he is at and give them prove of when Santa will arrive and where he is currently at. In conclusion, if u don't believe in Santa then download this app and keep your beliefs to yourself and give someone who is close to you a good Christmas. This is one of the stupidest apps you can get and Santa is not real if he was real would you really think he would be found by one crappy app that's free is app is the most fake, stupid app I have seen why do people think Santa real he is a fat man in a red suit crawling throw your chimney I would call the cops if a fat man in a red suit broke in! (i am 12 and believe in Santa so yea.) i waz like here is another Santa tracker. but it is soooo realistic because it said it was snowing at the north pole So I looked at the weather channel and it was right I believe in Santa and this app makes me believe even more. FOR MORE PROOF: I've seen my elf on the shelf move and I've talked to Santa in my house and I checked my parents were asleep the whole time SANTA IS REAL!!! My family and I use this app every year and its great! It lets my family and I know the current location of Santa Claus. I can't wait until Christmas! this is a great app! kids are still using it even after christmas to see what santa is doing! i think you should make a easter bunny tracker, kids would love it! For real? This is a thing? This app is fairly elite among the websites and other apps about Santa Claus. However, I think you should still work on it. On Christmas Eve, I was trying to check the app but it would freeze and exit every time I tried. Please fix this. Don’t let anybody tell you that Santa isn’t real! How would they know if he was real or if he wasn’t? Just believe! People say A”Oh there’s no such thing as Santa Clause “ But I believe in him because how could your mom and or dad do all this in one night. It’s 2:00 am it said he came to my home, I get up, under the tree nothing! The people who say Santa is fake are either haters or just people who don’t celebrate Christmas. Don’t put down people haters. I’m 10 years old, and I know Santa isn’t real. But this app is so fun! It’s just cool to see it if it WAS real, ya know? This is great for kids who still believe in Santa! OMG THIS APP IS AMAZING! I love how it tells you where santa is when its not even christmas. This app restores belief in Santa after kids have already accepted the fact that he isn’t real. Eventually when kids figure out he isn’t real it makes them even sadder. It is fine to believe in Santa but when you get to old you have to learn the truth. This is why I don’t like this app. I loved it. Definitely a do-again. I love this app it is so accurate.It tells me where the big guy is and where his next stop will be.I never question if he’s real because I leave notes for him and sure enough he writes back.Just want to say keep believing! 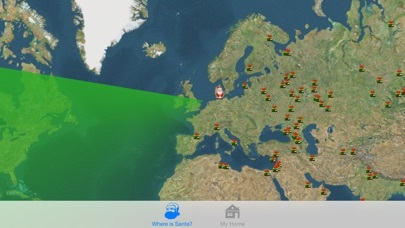 This is an awesome app that allows you to see all Santa’s movements. I recommend this to anyone who believes in Santa. Awesome app, had it for a year now and last Christmas I was on that all night, tell it said he was at my house so I ran downstairs and heard a weird sound on the roof and there where presents everywhere! Now I believe and I hope you will too. Okay I’m 8 and its Christmas Eve and I love this app I I’m going to stay up with my tablet and if it says he’s in Idaho and near or at my house I will get up and NOT wake up my parents and cach him in the ACT anyway I love this app so much and I believe I believe I believe I believe I Believe ! I live in the U.S.A so I can see where Santa is currently and where he is going to be next. Merry Christmas!! This app has brought joy two my two little cousins life’s and a want to thank the people that made this app for that. This app also made me realize that the Christmas season is not about a little fat man with a red suit. What this app has shown me is that even though Santa is not real you can enjoy Christmas no matter how old you are. Also Christmas when you get older can show you a new way to look at Christ the savior. Thx. I stayed up all night (I’m one of those people believe it or not) trying to catch “Santa” on my phone and when I looked on my house thing-ama-thing, NOTHING!😡. But the app is pretty cool. When it’s not Christmas Eve, the Locator says what Santa is doing. the concept of this app is very cool and could entertain a lot of people, however i’m assuming the majority of the users would be children. i’ve already gotten about 3 ads from using this app (by opening it once) and they were all for sexual websites, f*ck buddies, or p*rn sites. i believe that’s just unacceptable since there would be kids using this app. not to mention that the ads aren’t just in app, they take me to my safari which would lead children to also feel it’s okay to use it since it’s now on a website. It was Christmas Eve, I checked the app and it said 10-40 minuets before he arrived and I was really excited. A few minutes later it said “Santa will be back next year!” That confused me as me and my family just came back from dinner and my parents were in the living room where the fireplace was. I deleted the app. I don’t know what happened. Santa is real but obviously this app isn’t! Ok, so I stayed up. For an hour it said Sant will be there in 10~40 minutes. Ok . . . so I waited an hour. It’s now 12:37 and I looked at the app again and looked at my house and it said Santa will come back next year!!! Uhhhhh . . . my parents are still awake and upstairs and I’m still waiting for Santa. Has Santa forgotten about me? Like seriously. Some app. Next year if it does this again I’m deleting this app. And it kept on crashing, whenever I opened the app it would just take me out again. It took me around an hour to get in there just to figure out it’s a fake thing. STUPID! I’m not happy if you can tell. I’ve read the reviews and I’m pretty sure (the ones that say they saw Santa and stuff) are fake or something. I’m only giving it a 5 star so it goes to the top. This app takes you to a website that makes you think that you have a virus, and wants you to download something to “remove” the virus. And Santa doesn’t exist, it’s impossible for him to travel so fast. This app glitches me out every time I try to open it but sometimes it will work then immediately glitch me back out again and when I go back in it is one the whole other side of the WORLD!!!!!! This is the most real one I seen! The other is junk, but this is not! It said 10 minutes I couldn’t wait! Thanks! 12-24-17 11:25 PM So, I downloaded this app and set a timer for a few minutes before the estimated arrival of St. Nick. I will update this review when I wake up Christmas morning. I didn’t rate it very high because it keeps kicking me off. I’ll press the scan button or home button and it shuts off the app. I loved it and it worked well until I couldn’t find Santa because the app was glitching. All night of trying to track him down and I couldn’t find him thanks to this app. The app crashed immediately after opening it :( very disappointed. It worked so well the past few years. Hit home and it crashes app. Click on “my home” if you want to quickly close this app. Given that there are 2 buttons on the Nav, this is horrible. Worked for about an hour. Now, as it gets later in the evening, it crashes every time we open the app. Deleting and getting a different Santa tracking app for my kids. It's cool but it just exits you out of the app all the time. santa isn’t real🤠if santa was real please explain to me why kids who work hard and try to be nice hey barely anything and bully’s get new computers and phones? I am going to be twelve in January and I use this app every year! And by the way, Santa is Real! When I was 6 I clearly remember hearing hoofs on the roof and I ran down stairs. I did not see Santa, but I did see presents, and my elves were nowhere to be found. The next morning the elves were back and there were the same amount of presents! Any way, LOVE SANTA TRACKER!!! Parents always try to tell kids that Santa is not real, but there lying. Santa is real!!!! This app was alright. It's fun for seeing wher Santa is. The truth is....Santa isn’t real. And bombarding these kids with apps, stories, etc. trying to say Santa is real, will damage their trust. Every kid eventually finds out from around ages 9-12, you can’t stop it. Then they will start questioning why the people they’re supposed to trust most, their parents, would lie to them. They will also wonder who is telling them the truth anymore. I understand the point of this tradition....but it usually ends up in someone getting hurt. Although this app is supposed to be fun, it’s just fake, along with everything having to do with Santa, besides the actually Saint Nick, who is real. I just don’t understand the point of lying to innocent children, who the parents and other adults know would believe it. This whole ‘Santa’ story, is just damaging to kids. That’s all I have to say. I remember I used this last year so cool! I on my other app it says Santa is in Asia and on this one it says he is in the North Pole! It is very interesting but doesn’t work well. This app is amazing because you can check were Santa is and were he has dropped presents of.Thanks for making this app. Will not stay on. Do not download!!!!! This is an okay app... but is Santa really real? No. So why should people be teaching kids to believe in Santa Claus? They shouldn’t. Cuz he’s fake. So how on earth can they tell where Santa is? They can’t. App keeps crashing and unable to open. Please fix. So, I went on other santa apps and it says santa is in Russia right now but on this one it says he's in China I hate this app it's fake don't believe it! Every year for Christmas, our family always uses this app. I always brings happiness to our family when my young niece and Nephew are asking when Santa's gonna come! Probably the best part of this app is simply the the kids want to go home to sleep! Don't wanna miss Santa! It’s a amazing app that ACTUALLY LETS ME SEE WHERE SANTA IS at ALL TIMES!!!!! It is a amazing app, and supercool and informative. However, it’s the ads at the bottom of the screen that really bug me. It’s small and picky, yet SO SO nagging. This app is AWESOME, but it won’t open! I’m 7 Years Old And I Believe! I Know A lot Of You Do Not Believe In Santa Claus And That Makes Me Really Sad😭 Because I Want People To Believe Him! Here Are Some Clues. You Think It’s Just Your Parents, But Hear This! 1. How Do Your Mom And Dad Wake Up At Midnight? 2. Where Do They Get Hundreds Of Presents? 3. Have You Ever Seen Santa? I Saw Him Last Year Coming Down My Chimney So I Raced To My Room So He Didn’t See Me. So Believe Santa NOW!!!!!!!!!!!!!!!!!!!!!!!!!!!!!! If You Want To Know Stay Up All Night On Christmas Eve This Year And See What Happens! I Know You’ll Believe Soon. Merry Christmas And A Happy New Year! I do not believe that Santa was a pastor! That is how stories were told! He is real! U may not believe it but I do! Come on people!!! Why the hell are we lying to KIDS!!!!!! Santa is not REAL! Although it is fun to believe. Once you find out it RUINS YOU! We don’t need to influence this! I love this app! I believe in Santa so, I just love it! Almost anyone who believes in Santa will love this app! I don't mind that people don't believe in Santa but trying to convince people that Santa is not real is just dumb. You can ruin child hoods and it makes people sad.STOP SAYING SANTA IS NOT REAL!!!!! Installed and doesn’t stay on for more than 10 seconds without crashing. The app glitches good. When I went into it it kicked me out right away. I tried 8 times and I got kicked out not even pressing the button horrible! You gave me PROOF!!! in a good way! So I’m a 8year old girl and I hang out with the boys at my school. Anyways Long story short one of them don’t believe! So I told him about the app being him he still didn’t believe! So on ptg night my friend brought his iPad so I showed him the app and he said he kinda believed! Anyways it’s a start! So I really wrote this review to say thanks! I will say that this is a very interesting app but despite what people are saying he is not actually real, yes, he was at one time hundreds of years ago but his actual story is almost completely different from the ones you hear nowadays. He was a pastor back in England who gave to the poor and to the three woman when they didn’t have enough money to marry three men or however the story worked. He was eventually persecuted and that is the true legend of Santa clause (real name: saint Nicolaus) or the short version anyway. There is actually much more to the story. So just wanted to say that this app is just to entertain you during the Christmas season and the design was cleverly made and I’m kinda impressed that it makes it look and seem so real. But, alas, Santa is not real. *edit* y’all need to realize the true reason for the season and that’s Christ’s birth. If it wasn’t for him being born into the world and dying on the cross (the real reason for Easter) we would not be here. 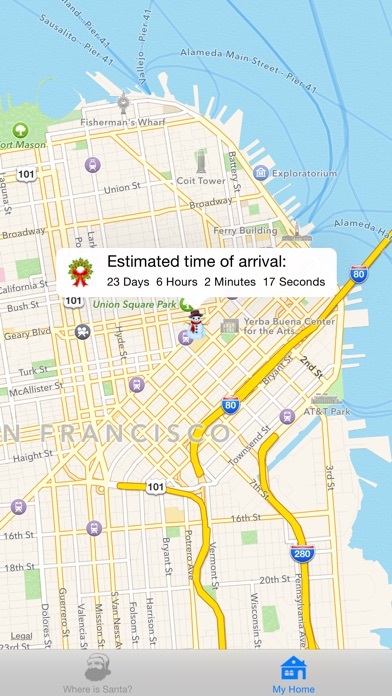 Love the app - child or adult very - creative responses to Santa’s whereabouts. I love this app so much .Santa is real and always will be,to me. I believe in santa! When I was awake I heared bells. So I looked outside the window and there he was on my cousins house with his reindeer! I was amazed!! And then my house was next because I knew that because i heared footsteps on my roof So I fell asleep woke up 10 minutes later And my presents were there! My stocking was full.the cookies were gone. Milk has been drunk. And my parents only had 90 dollars which is 180 together.. And They couldn’t have got me my Christmas presents cause I got toys that were above 100 dollars so SANTA IS REAL AND START BELIEVING NOW! Just a wonderful little tracker to keep an eye out for you know who. All the little ones best get to bed in time on Christmas Eve. Merry Christmas! I mean like this is a good app in fact. Because you don’t have to waste your time searching the internet and find this type of thing. But then the reviews are well, nothing to do with this app. They say “oh mah Santa is real! !” and some others about your beliefs in Santa. So why can’t you guys stop writing those kind of reviews? But hey, Beliefs are beliefs. Some people believe and some people don’t. But in all this app is a good one indeed. Santa is not real. You can keep believing all you want but the longer you do, the more heartbroken you'll be to find out he isn't. I'm 11, and I stopped believing in him when I was 9! I asked my parents until they told me and I found it out. Same thing goes for an Elf on the Shelf, your parents move them around the house and do whatever with them. I hate hate HATE that people 10 and over still believe in this nonsense. Lol sorry I'll stop ranting. I keep hearing ppl say they heard santa on their roof like a ton of ppl. I have a feeling these r fake ppl ._. Every time I open the app it crashes and I tried everything I could I fix it. The app worked great on my phone but when I got it on my iPad, It kept crashing the second I got in the app. If anyone else has this problem tell me how to fix it. Ok santa isn’t real. Your parents or guardians set presents under the tree. your parents want you to go to bed while they put the presents under the tree and I know because I saw my parents doing it I’m 11 and I knew it was not real. I’m 10 years old and I believe in Santa,my friend doesn’t believe that santa is real.last year I used this app and I loved it.If I were you I would use this app.Even though the app doesn’t look popular anymore I still love this app and you should REALLY GET THIS APP!!! I’m 12 and Last Christmas my parents woke me up and my brother and we went downstairs. My mom pulled out her phone and dialed a number and all the sudden, there was a new iPhone 7 box on the table, and it was ringing. So I walk d up to it and said, “how did you know this was here” And at that very moment, I knew it was my parents, not Santa Claus, the fake phoney he is. I love this app because I Love tracking him HE HIS REAL!!!!!!!!!!!!!!! I DONT WANT TO KNOW WHAT HE IS DOING!I WANT TO KNOW WHERE HE IS ALL YEAR LONG INSTEAD OF TELLING ME HE IS HELPING HIS WIFE IN THE KITCHEN! I WANT TO KNOW EXACTLY WHERE HE IS SO I CAN TAKE HIM HOSTAGE AND KILL HIS ELVES EVERY HOUR UNTILL EVERYONE GETS WHAT THEY WANT.